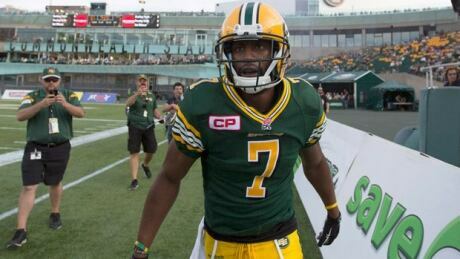 Matt Nichols threw two touchdown passes as the Edmonton Eskimos won their fourth in a row with a 30-5 victory over the Saskatchewan Roughriders on Friday. 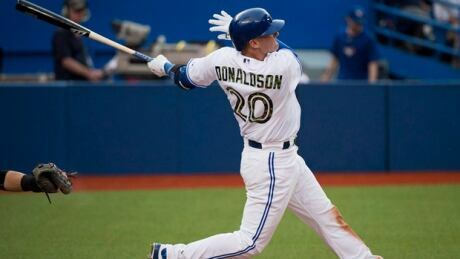 Josh Donaldson hit a walkoff single in the bottom of the 11th inning as the Toronto Blue Jays beat the Kansas City Royals 7-6 on Friday night. OXNARD, Calif. (AP) -- Cowboys quarterback Tony Romo missed the second full practice of training camp Friday because of a sty in his left eye. Canadian Eugenie Bouchard withdrew from the Citi Open on Friday due to an abdominal injury. The emails aren't about exonerating the Pats. It is about showing an NFL office drunk on power and overwhelmed by prejudice. The Denver Broncos' biggest area of concern is their defensive line, where starting end Derek Wolfe is facing a four-game drug suspension. Midway through the first day of training camp, fellow defensive end Malik Jackson, who actually logged more snaps than Wolfe last year, strained his left calf. Jackson said he has to be patient especially with Wolfe missing the first four regular season games. FORT WALTON BEACH, Fla. (AP) -- Prosecutors say they've dropped a battery charge against Buffalo Bills offensive line coach Aaron Kromer, who was accused of punching a boy in the face for using his beach chairs in Florida. ST. LOUIS (AP) -- Before playing a down, Nick Foles has made a big impression on the St. Louis Rams. You are currently browsing the Sportspool.com Sports News blog archives for July, 2015.